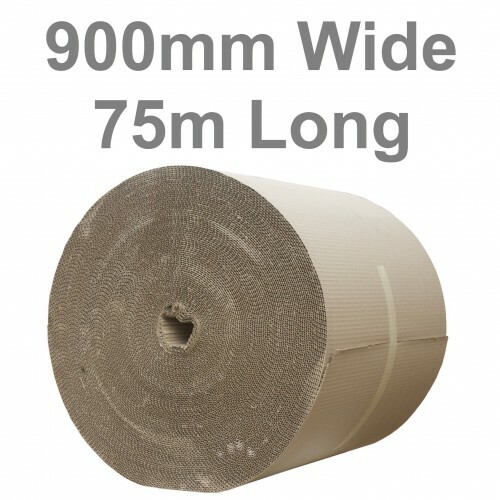 Our 900mm wide corrugated paper rolls are ideal for protecting a wide range of things including furniture. It can also be used as a void fill to fill gaps in cardboard boxes and prevent movement of goods during transit. Many organisations wishing to reduce plastics in the environment are using corrugated paper as an alternative to bubble wrap. These cardboard rolls measure 900mm / 90cm / 36" or 3' approximately in width. Each corrugated paper roll is 75 metres long. We supply this product in bulk to heavy users but for those with limited demand the smaller quantities on this site are available for next day delivery to most parts of the UK. Same day collection from our Coventry distribution centre is an option with same delivery UK wide also possible for very pressing deadlines. The answer is very straightforward really; this Environmentally Friendly Protective Paper Packaging is 100% recyclable. In applications where it can be used instead of bubble wrap, it can help reduce plastics in the environment.